Search engine optimization is public relations, Rebecca Lieb of Altimeter Group and author of The Truth About Search Engine Optimization tells guest host Sally Falkow (@sallyfalkow) in this special episode recorded today at the PRSA International Conference in DC. The next generation of PR professional will need be know SEO, data mining and how to think a publisher. Detailed show notes for this episode are not available. 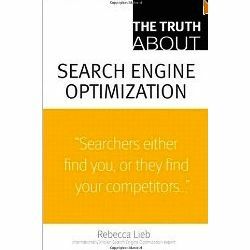 In her book, search optimization expert Rebecca Lieb brings together more than 50 absolutely crucial facts and insights decision-makers must know to drive more web traffic through better search engine placement. The Truth About Search Engine Optimization doesn't deliver abstract theory: it delivers quick, bite-size, just-the-facts information and plain-English explanations that executives, decision-makers, and even small business owners can actually use, no matter what kind of sites you're running, or what your goals are.